This listing is for the Small/X-small size in mango only; this size fits people with chests between 29" and 35", though if the biggest part of your torso is below your ribs, 36" will also work. We have two in stock in this color as of mid-October, and at the moment there is a mango colored one listed separately for six bucks less. The regular description follows. 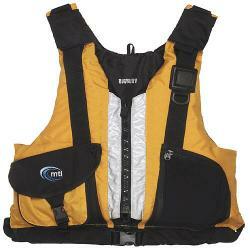 MTI's Big Buoy is a vest with a type III rating but type V flotation. 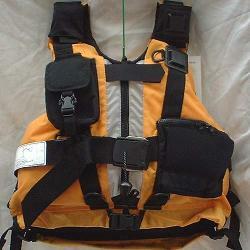 The type III rating is due to the lack of a flotation collar. 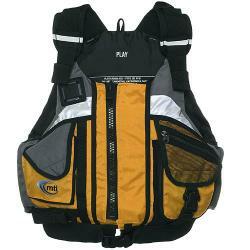 It is a short jacket that allows hardshell kayakers to wear a sprayskirt. For most people it will not quite come down to your belly button. 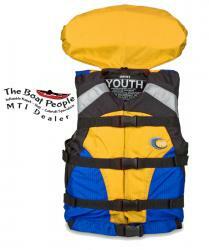 The Small/XS size has 26 pounds of flotation. Big Buoys have adjustable shoulder straps, two big pockets, three cinch adjustments on each side, a knife lash, and two plastic D-rings for whistles, etc. There is a lot of foam packed into the fairly short front panels of the Big Buoy. You will sense this bulk when you wear it, especially when you are trying to climb back into a raft after a swim. Some people have loved these jackets and even ordered more for their friends. Other people have whined to no end, but if you think it will be a problem please stay with a standard model like the Canyon type V - which no one has ever complained about. And try to understand that there is no free lunch where buoyancy is concerned, or a special "magic foam" that has more flotation than another foam. 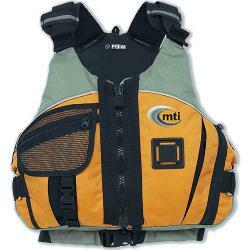 More flotation on a lifejacket means more cubic inches of foam. More foam either means short thick panels or very long not-so-thick panels like on some of the other type V models.